Rosemary Stirling, later Wright, was one of the heroes of the 1970 Commonwealth Games in Edinburgh when she won the 800m on the last day. Ranked in Scotland for performances as early as 1964 she was a firm favourite of athletics supporters on both sides of the border. With Georgena Buchanan she was half of the GB team that broke the world record for the 4 x 800m in September 1970. Colin Youngson has put together this profile of a wonderful athlete. “Born in Timaru, New Zealand, on 11th December 1947 of a Scottish father and English mother, she started running at the local club’s handicap events in Whakatane before moving to the UK in the mid-1960s.” She joined Wolverhampton and Bilston in the English Midlands. 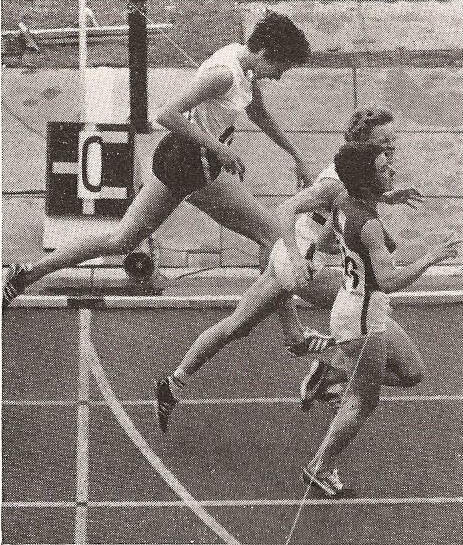 In 1966 Rosemary won the SAAA 440 yards title and then, Gillon says: “She was selected to run for Scotland. ‘My grandparents were proud Scots and so was my dad,’ she said, ‘so I accepted.’” The following week, as Shields says: “Her breakthrough came at the AAA Championships where, although finishing third in the 440 final, she bettered the Scottish record in the semi-final with 54.5. To put this in perspective, as an 18-year-old, she was now ranked in the top five all-time in the UK. Finishing behind her in that semi-final was a young Lillian Board, destined for tragically short-lived greatness.” Doug Gillon reports: “Rosemary Stirling was offered an England vest immediately. ‘I told them they were too late, that I had already committed to Scotland. I never regretted it. 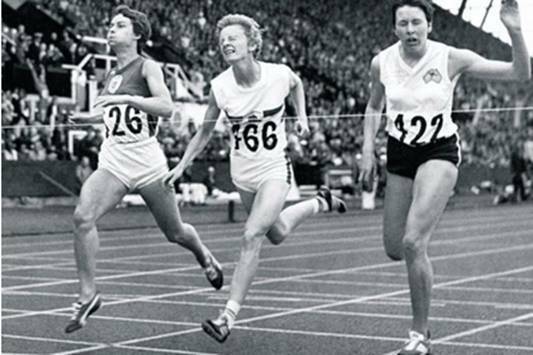 Scotland, with smaller numbers, really looked after you.’” At the Commonwealth Games in Jamaica, 1966, Rosemary Stirling was fourth in the 440 and 880 finals, recording Scottish records on both occasions. The ‘Athletics Weekly’ report by Mel Watman was as follows. “In the entire history of Track and Field Athletics there has never been a race that was more exciting than this one. From my own point of view, even the Chataway v Kuts epic will now have to take second place. On paper France couldn’t lose but, luckily, races are fought out by people on tracks, and not by mathematicians or computers. There was one obvious chink in the French armour, though. Instead of ending up with the double grand slam of Colette Besson and Nicole Duclos – a partnership almost guaranteed to make up any deficit – the team management opted for Duclos on the second leg and Besson on the anchor. This made the French extremely vulnerable on the third stage with Janet Simpson in pursuit of Eliane Jacq. If Janet could be close sufficiently then Lillian Board would be in with a chance against the tempestuous Besson. Rosemary Stirling, her troublesome foot feeling the strain of five races in as many days, led off with the utmost of her current ability. She handed over with a few girls ahead of her but her time was 54.2 (0.1 outside her best ever) and Britain was in touch. On the second leg Duclos rushed from third to first along the back straight – overtaking the Russian and West German – and continued to pile on the pace for the rest of the distance. It was an awe-inspiring run – TIMED AT 50.6 SECONDS – and at the end of it, France was nicely set up some ten yards ahead. But only ten yards up, for Pat Lowe – who has never run faster than 54.6 off blocks – produced another of her inspired relay performances. Running perilously close to her optimum 200m pace for the whole circuit she covered her lap in an heroic 52.1. Britain’s chances had been kept alive. Now it was Janet Simpson’s turn. Bitterly disappointed with her showing in the individual final, this was her chance to show why she came fourth in the Olympic final. Never allowing herself to be flustered, she gradually cut down her French rival and, although she could have forged ahead in the final strides to hand Lillian a lead, she deliberately held back … and still ran a superb 52.1! The advantage in the anchor leg of the relay rests with the runner who takes over just behind and that was just the position in which Lillian found herself. Would Besson destroy herself? As she pulled away from Lillian with every stride it looked for a while as though it would be no race, but then came the realisation that the French girl was travelling too fast for her own safety – a situation borne out by the splits that became known later. Besson covered her first 200m, during which she opened up a lead of 6-8 metres, in a suicidal 23.6! Worse still, at 300m – when some 10 metres up – her time was an almost unbelievable 36.1 … 48.1 speed for 400m. No woman – and not all that many men – could get away with it. ‘Athletics Weekly’ journalists Cliff Temple, Dave Cocksedge and Mel Watman compiled the Commonwealth Games Reports. “It was four years ago, at Kingston, that Rosemary Stirling – then 18 – surpassed herself by placing 4th in the 880 in 2.05.4. Since then she has run in several world record relay teams and produced the occasional world class performance, but a combination of repeated injuries and a certain lack of confidence prevented her from reaching the heights expected of her. Although possessed of all the necessary qualities to break 2 minutes for 800 metres she was in danger of falling well short of her potential. Not so now. By winning this important title, her first, in a race in which she had to drive herself unmercifully for the entire length of the finishing straight, Rosemary had proved to the world that she is a champion. More important, she had proved it to herself. From now on, we can expect to see a more assured runner. The race, as exciting as they come, was marred by Sheila Carey’s misfortune. She tripped and fell soon after the field merged along the back straight. After a few seconds hesitation she started running again and pluckily finished but it was a deeply distressing experience for Sheila, rated favourite for the title. Rosemary Stirling and Pat Lowe were two runners affected by Sheila’s fall but they managed to regain their balance without losing much ground and at the bell (63.6) it was Gloria Dourass of Wales ahead of Lowe, Cheryl Peasley (Australia) and Stirling. Peasley, a strapping 19-year-old with fast 400m and 1500m times to her credit, took up the running after 550m and with half a lap to go the race was clearly between her, Lowe and Stirling. The Australian continued to lead into the finishing straight but the two Midlanders (though New Zealand-born Rosemary was representing Scotland, of course!) were poised to strike. A relentless struggle ensued … and it was Rosemary – on the outside – who prevailed by the narrowest of margins. Both Rosemary and Pat have made courageous recoveries from injures that a few weeks ago threatened their very participation in these Games, and it was tough that one of them had to lose. Shields and Black: “Returning to the 400 scene later that season, she set a national record of 53.9 with her first outdoor win for Britain in Warsaw and repeated this feat in the 800 (2.04.2) in Bucharest in September. That same month she helped Britain to reduce its own world 4×800 record by two seconds to 8.25.0. In 1971, Stirling improved her 400m time to 53.24, a Scottish record. She also won bronze in the European indoor 800m, retained her Scottish title, was second in the AAA and third in the European outdoor 800m (2.02.08, another Scottish record). In addition she also brought Britain up to fourth on the final leg of the European 4x400m, recording an outstanding split of 52.6, quickest in the team and her fastest ever. Shields and Black: “Marrying English international distance runner Trevor Wright after the Olympics, she ran steadily thereafter, representing Britain internationally until 1975.” Rosemary won her final Scottish 800m title in 1973 and also won bronze in the AAA outdoor 800m. Between 1966 and 1981 she topped the annual ranking lists for 220 yards (once), 440 yards (once), 880 yards (once), 400m (six times), 800m (six times) and the marathon (once, recording 2.43.29 to win the Gloucester Marathon in 1981). Then the Wrights emigrated to New Zealand and settled in Tauranga. Their daughter Jess Ruthe ran for NZ in the World Cross Country Championships; and her sister Emma was NZ schools 800m bronze medallist. Rosemary was team manager of several NZ teams, including for the 2008 World Cross in Edinburgh. Trevor’s grandson is Julien Matthews is a sub-four miler who ran in the Commonwealth Games in Glasgow in 2014 and finished ninth in the 1500m final. 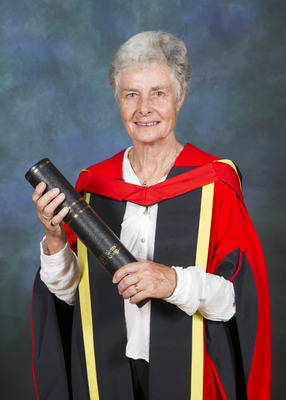 In June 2014 Mrs Rosemary Olivia Wright (nee Stirling) was awarded the honorary degree of Doctor of the University of Glasgow in recognition of her sporting achievements. And that’s where Colin ends his look at the career of Rosemary Wright. The GB World Record Relay mentioned at the top of the page was reported in the ‘Glasgow Herald’ as follows: “At the Coca-Cola International Invitation Meeting at Crystal Palace on 5th September, 1970, they obliged but the race did not go as expected. Let Ron tell the tale: “Two Scots, Rosemary Stirling and Georgena Craig, shared in another world record, though only through the disqualification of the West Germans. 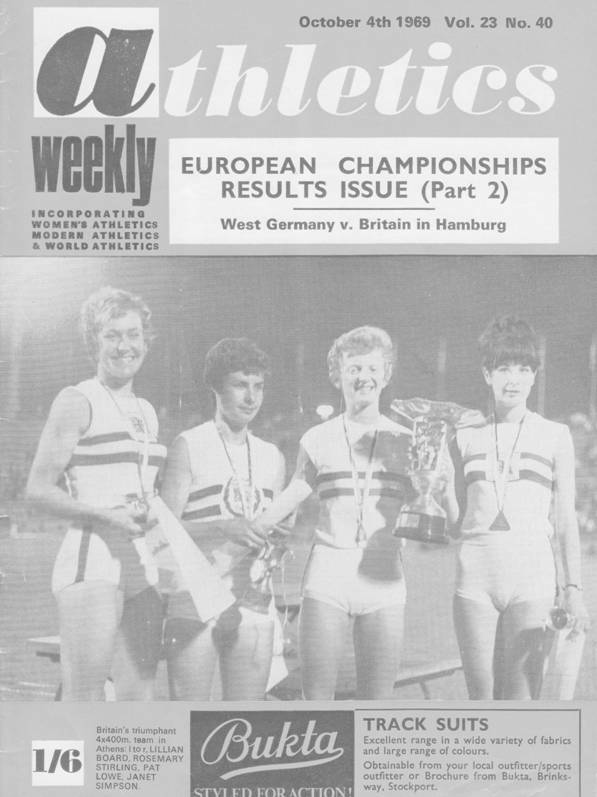 The West German Women’s 4 x 800m relay squad broke the tape in 8:22.6, a world record, but were disqualified for passing the baton on the first leg take-over out of the legal area. So the world record went to Britain (Miss Stirling, Mrs Craig, Pat Lowe and Sheila Carey) who finished second in 8:25, two seconds inside the record set by Britain earlier this year.” It was the second time that the record had been broken that year – the only change being because Lillian Board was too ill to run and Georgena Craig had been drafted in. Statistically, Rosemary appeared in the Scottish lists from 1964 through to 1985 in a wide range of events. 220 yards, 200m, 440 yards, 400m, 880 yards, 800m, Mile, 1500m, 3000m and from 1980 she was ranked only at the marathon where her best time was 2:43:21 which made her top rated Scot in 1981! Had she not been living in New Zealand at the time, a new international career might have beckoned.